I have finished my AS year, whe-hey! Finally I am into study leave which, as nice as it is, having time off college and all - it is also the countdown to the quickly approaching exams. Enough of the doom and gloom though, onto the clothes! Almost everything I'm wearing today was from my recent shopping haul (here) - hence the title! Which I may have nicked off the recent E4 adverts but I'm sure they won't mind. My legs have (almost) made an appearance due to the slightly warmer weather unfortunately taking a turn towards typical-English-summer-weather so I've not quite made the leap to bare legs! These are my all time favourite denim shorts, they're vintage Levi's bought from Urban Outfitters several years ago. They're snug as a bug around my waist and bum which I love. My only slight problem with them are that they get a bit tight when I sit down, but that gives me the bit of motivation to tone up and slim down my thighs. I have fallen in love with this grey jumper, it's so cosy and soft but not too bulky. 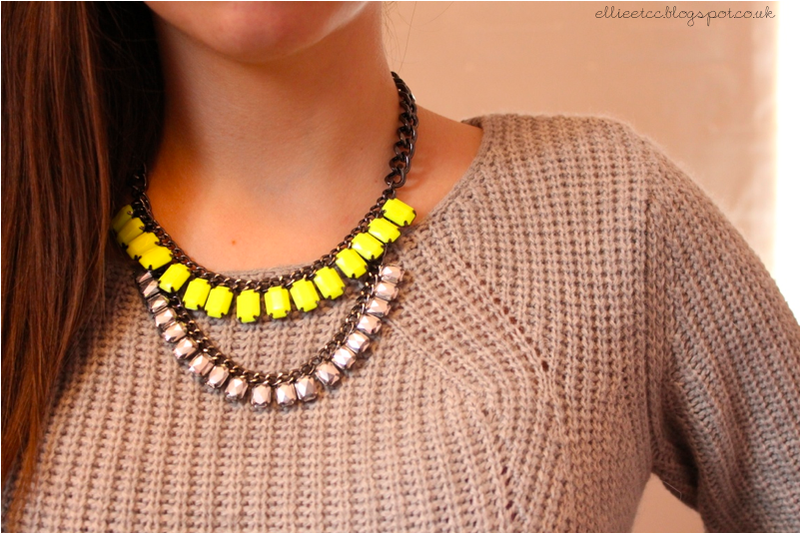 I especially love it teamed with the yellow neon necklace. Both of these lovelies were shown in my shopping haul post here, along with my second pair of beautiful Topshop boots! If any of you have exams coming up, I wish absolute the best of luck to you all. They're not at all fun, but they have to be done and eventually they will be over!